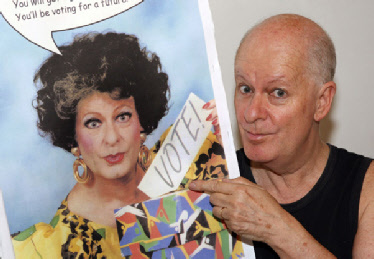 From the dawn of post-apartheid democracy in 1994, educating voters about the power and importance of using their vote has been one of Pieter-Dirk Uys’s prime missions. From his nationwide trek with Evita’s Ballot Bus in 1999 to the launching of Evita’s People’s Party (www.epp.org.za) in October 2008, PDU has emphasised that voting is not only a right and a privilege, but is also a responsibility for all citizens. Always up to the minute, in 2011 Tannie Evita began her posts on Twitter (@TannieEvita) to encourage voters to participate in all South African elections: municipal, provincial and national. In 2015, Tannie Evita added a weekly YouTube commentary, Evita’s free Speech, in which she comments each Sunday on the news of the day. This section of the Pieter-Dirk Uys website brings together articles specifically related to South African elections, voter registration and voter education. The articles are arranged chronologically (see the drop-down menus above). The people must lead and the government can follow. Vukuzenzele!